Washington, D.C. – October 21, 2013 – The 2013 Washington International Horse Show (WIHS) hosted its Regional Horse Show in conjunction with the USHJA Zone 3 Finals this weekend on October 18-20, 2013, at Prince George’s Equestrian Center in Upper Marlboro, MD. The competition is a precursor to the 55th annual Washington International Horse Show, which will run this week, October 22-27, at Verizon Center in downtown Washington D.C. The WIHS Regional Horse Show and USHJA Zone 3 Finals won the 2013 Member's Choice Award from the United States Hunter Jumper Association. This award provides exhibitors and participants the opportunity to reward excellence at USEF-licensed hunter/jumper competitions through their feedback relating to the competition, the facility where it took place, footing, competition personnel and hospitality. 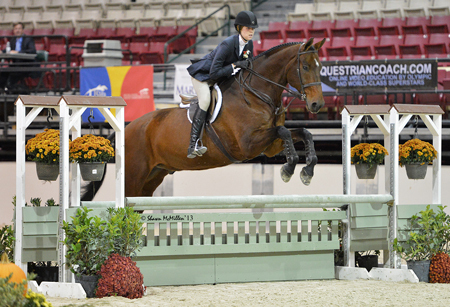 The regional competition gives local riders a chance to qualify to compete in the WIHS Championship Finals in the children’s and adult hunter and jumper divisions. The WIHS Championship Finals will feature the $10,000 WIHS Children's Hunter Championship and the $10,000 WIHS Adult Hunter Championship on Tuesday, October 22. The $10,000 WIHS Children's Jumper Championship and the $10,000 WIHS Adult Jumper Championship will both be held on Wednesday, October 23. The big equitation win of the weekend went to Emily Ambach (18) of Chevy Chase, MD, in the Gittings Horsemanship Finals. Trained by Miranda Scott, Ambach guided her mount Renaissance to victory with a fantastic jumping round followed by a well-executed test in the top five. Alyssa Rhee and Futuro finished second and Rhys Drewyer and Amigo were third. Ambach, who is currently studying Communications at American University in Washington D.C., has leased Renaissance for the last year. It was her first time showing in the Gittings Horsemanship Finals, but she had been to the regional competition in previous years showing in the Children's Hunters. This was her last show competing as a junior and a momentous win for the rider. Renaissance, a 15-year-old Hanoverian gelding, stands above 18 hands and had success as a hunter before, including the Regular Working Hunter championship at WIHS in 2008. “In the ring he always knows what he is doing, and it is just reassuring to have him,” Ambach related. Ambach had a good feeling on the day of the finals and knew that she could trust her experienced horse to put in a good round. After a great test, Ambach was named the winner and went out on top in her final junior year. She will now continue with college and hopes to keep riding as much as possible. She thanks her parents and her trainer for all of their support. Other equitation divisions in the weekend's WIHS Regional competition included the MHSA Adult Hunt Seat class, which saw a win for Paige Messick aboard Bucephalus LLC's Over Achiever. Cheryl Ainsworth and Denile finished second with Julie Bigham and Pas de Chat in third. Messick was also victorious in the VHSA Adult Amateur Medal with Ainsworth once again finishing second. Omar Del Valle placed third in that class aboard Clay Hill Stables' Beaujolais. In the VHSA Children’s Medal, Carilynn Peyton showed Tyler Stewart's Carson to victory with Clair Newton and Stoneridge Farm's Upshot in second and Bray Norman aboard Rosalind Watkins' Sincerely in third. The MHSA Hunt Seat on Ponies was won by Catherine Black aboard Linda Foster's Swizzlestick. Ava Ellis and Peakewood Pharm, Inc.'s Money Tree placed second with Jianna Simcik and Charleez Simcik's Tinseltown in third. Black also won the VHSA Pony Medal, followed in second by Lydia Davidson riding Michele Hazel's Ladybug. Maya Lombardo rode her own Just Jack to third place honors. In the hunter divisions, Brooke Cole earned the championship tricolor in the Adult Amateur Hunter 18-35 Zone Finals aboard her horse Markelo with Kathryn Luke and Brazos in reserve. In the Adult Amateur Hunter Over 35 Zone Finals, Lara McPherson guided Brooke Cole's Poetic Justis to the championship over Cindy Schmidt and her own Surfs Up in reserve. The Children’s Hunter Horse 14 and Under also hosted their Zone Finals over the weekend with a championship win for Sloan Hodges and Jet Stream K. Mary Claire Medeiros and Olivia earned the reserve championship. In the Children’s Hunter Horse 15-17 Zone Finals, Emily Todd earned the championship riding Jack Sparrow and Olivia Baldwin and Outrageous finished in reserve. The Small/Medium Children's Hunter Pony Final presented its championship to Damingo, owned by Carol Eichner and ridden by Adam Edgar. Helicon Stowaway, owned and ridden by Raeann Jones, finished in reserve. The Large Children's Hunter Pony Zone Final was won by Michele Hazel aboard her own Ladybug. There was a tie for reserve champion between Lillie Honiberg riding Stoneledge Coralea and Erica Rose aboard Woodland's Mr. Mischief. In the jumper divisions, Sandra Zimmerli rode Apollo Mission to victory in the Children’s Jumper Zone Finals with Summer Seeley aboard Flynn Ryder in second and Jillian Kaufman riding Double Dutch in third. In the Pony Jumper Zone Finals, Helen Jones and Point N Shoot took the top prize over Emma Ellis and Tangled Up In Blue. Arwen Nanson and Melinda Cohen's Cruisineety Z won the Adult Jumper Zone Finals. Jenny Colgate and Ever So Clever finished second with Juliette Landis and Shiraz in third. The Low Children's Jumper Zone Final was won by Carly Williams aboard High Hopes with Sarah E. McDonald and Turn To Beat in second. Emma Hess and Laramie Fink's Newbridge placed third. The Low Adult Jumper Zone Final saw victory for Carla Quinn Loyd aboard Daydreamer. Jessica Kars Landis and Escalado placed second with Megan Manubay and Street Fighter in third. WIHS Regional and USHJA Zone 3 Finals would like to thank a few of their sponsors for their support, including Chatham Hall, presenting sponsor of the Large Children's Hunter Pony division, The Saddlery, who provided apples and carrots for the horses, and The Linden Group. All of the fantastic regional competition in Upper Marlboro, MD, leads up to this week’s 55th annual Washington International Horse Show, featuring many of the nation’s top horses and riders and several of the world’s best competitors. To find out more about the 2013 Washington International Horse Show, and to buy tickets, please visit www.wihs.org/tickets, join us on Facebook, and follow us on Twitter. 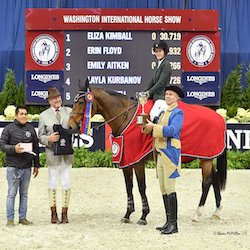 Established in 1958, the Washington International Horse Show attracts more than 20,000 spectators to the six-day show, which includes Olympic-level competition along with community and charity events. More than 500 top horses and riders come to D.C. from all over the globe to jump for nearly half a million dollars in prize money. Event highlights include the Puissance high jump competition on Military Night (Friday), the $125,000 President's Cup Grand Prix, a World Cup qualifier (Saturday night) and Kids' Day (Saturday), a free, fun and educational community event. The Washington International Horse Show Association, Ltd. is a 501(c)(3) nonprofit charitable organization headquartered in Washington, D.C.